Ketubah: a work of art expressing the love and commitment of marriage. The traditional art of the illuminated ketubah, the Hebrew word for marriage contract, is an art form with earliest examples dating back 3,000 years and is a central component of the Jewish wedding. When Israel was established, the ketubah text was standardized. 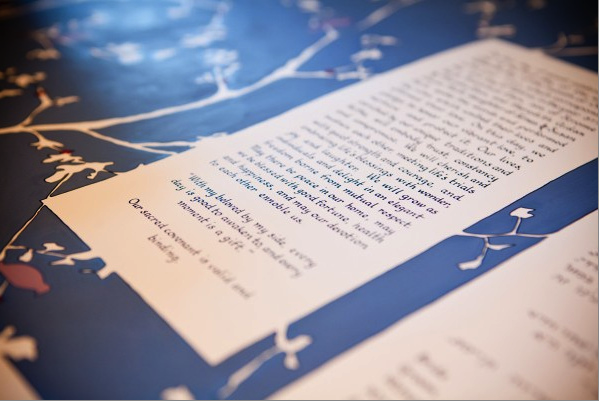 During the 1970’s, illuminated ketubot (plural of ketubah) experienced a resurgence that has continued, not only among Jewish couples, but among others who wished to have a custom written document celebrating their marriage. Art Deco: The predominant decorative art style of the 1920s and 1930s characterized by precise and boldly delineated geometric shapes and strong colors and used most notably in household objects and in architecture. During its heyday, Art Deco represented luxury, glamour, exuberance, and faith in social and technological progress. Art Nouveau is considered a “total” style, embracing architecture, graphic art, interior design, and most of the decorative arts including jewellery, furniture, textiles, household silver and other utensils and lighting, as well as the fine arts. According to the philosophy of the style, art should be a way of life. For many Europeans, it was possible to live in an art nouveau-inspired house with art nouveau furniture, silverware, crockery, jewellery, cigarette cases, etc. Artists desired to combine the fine arts and applied arts, even for utilitarian objects. In the United States, it became known as the “Tiffany style” due to its association with Louis Comfort Tiffany. Aramaic: a Semitic language, a Syrian dialect of which was used as a lingua franca in the Near East from the 6th century BC. It gradually replaced Hebrew as the language of the Jews in those areas and was itself supplanted by Arabic in the 7th century AD. Aramaic uses the same characters as the Hebrew alphabet. Calligraphy: art of beautiful, stylized, or elegant handwriting or lettering with pen or brush and ink. It involves the correct formation of characters, the ordering of the various parts, and the harmony of proportions. In the Islamic and Chinese cultures, calligraphy is as highly revered as painting. In Europe in the 14th–16th century, two scripts developed that influenced all subsequent handwriting and printing: the roman and italic styles. With the invention of modern printing (1450), calligraphy became increasingly bold and ornamental. Part of what sets my work apart is the calligraphy. An art form in and of itself, one can see the hand of the artist; the human element that no computer can imitate. Every letter drawn and designed and conceived of by my brain. Calligraphy and artwork are completely integrated. My process is a centuries old art form with each and every aspect of each ketubah is entirely rendered by hand. Gouache: similar to watercolor but modified to make it opaque. A binding agent, usually gum arabic, is present, just as in watercolor. Gouache differs from watercolor in that the particles are larger, the ratio of pigment to water is much higher, and an additional, inert, white pigment such as chalk is also present. This makes gouache heavier and more opaque, with greater reflective qualities. It is used most consistently by commercial artists for works such as posters, illustrations, comics, and for other design work. Arches: Arches paper mill (pronounced “ARSH” in French) was founded in Lorraine, France, in 1492. Though it has developed into a major manufacturer of high quality paper, Arches still retains its humble roots and fabricates its paper in the original mill. Its colorful history is closely linked to the history of France. Many literary milestones and works of art have been entrusted to Arches papers, including the publication of the complete works of Voltaire, a project begun in 1784 that eventually required 70 tons of handmade Arches paper, and Napoleon’s The Description of Egypt, printed between 1807 and 1823 on two million sheets of Arches paper – made by hand. In 1895, Arches entered the Industrial Age by using the cylinder mould to fabricate the finest art papers.